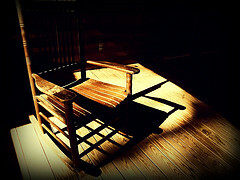 Rich Christian, Poor Christian: What and Where Is Your Rocking Chair? Over the last few weeks, my Bible Study class at my church has been doing the small group study on the Bill Hybel's book The Power of a Whisper: Hearing God, Having the Guts to Respond . In one of the lessons in this study, the metaphor of the rocking chair is used to describe a time and place where one meets with God on a daily basis to read God's Word and pray to Him. Through this consistent process of meeting with God, we allow God through the Holy Spirit to speak to our hearts as we hear from Him through the Word and prayer. For one man in Hybel's church, this place truly was meeting with God in a rocking chair on the back porch of his house first thing in the morning each day. For Hybels, he found for several years that the best place for him was to meet daily with God at a small diner down the street from his house. There were just too many distractions at home when his kids were young. So, whether it's a rocking chair on the back porch, a small diner down the street from your house, or sitting in your car during your lunch hour at work, we all need a place we can meet God each day. The Bible, God's Holy Word, is His direct revelation to us. In order for us to truly know the mind of Christ, we need to read and meditate on that direct revelation. After reading the Scriptures, we then pray back to God those things that we have learned from His Word. Through this process of reading and praying, we allow the Holy Spirit to speak to our hearts and minds. …these are the things God has revealed to us by his Spirit. The Spirit searches all things, even the deep things of God. For who knows a person’s thoughts except their own spirit within them? In the same way no one knows the thoughts of God except the Spirit of God. What we have received is not the spirit of the world, but the Spirit who is from God, so that we may understand what God has freely given us. This is what we speak, not in words taught us by human wisdom but in words taught by the Spirit, explaining spiritual realities with Spirit-taught words. The person without the Spirit does not accept the things that come from the Spirit of God but considers them foolishness, and cannot understand them because they are discerned only through the Spirit. The person with the Spirit makes judgments about all things, but such a person is not subject to merely human judgments, for, “Who has known the mind of the Lord so as to instruct him? But we have the mind of Christ. We all need the consistency of a set time and place to get alone with God in order for the Holy Spirit to speak to us. On some days, we're going to be "on schedule" and have that quiet time with the Lord. We're going to have powerful times of worship with the Almighty Creator of the Universe and clearly know the mind of Christ because the Spirit is speaking to us. On other days, we may be "on schedule," but we're distracted with the cares of this life. We can't hear the Spirit speaking as clearly through the distracting clutter in our brains. And on other days, our schedules are going to be so crazy that we can't even make it to the "rocking chair!" Stuff happens. Life is messy. Our neatly, planned-out schedules can get thrown off track. Don't give up, though, on the days when things don't go according to plan. Keep trying to get back to your rocking chair. Keep fighting to get back to that time and place in order for God to speak to you through His Word, prayer, and the promptings of the Holy Spirit. So, what and where is your rocking chair? Do you even really have one? Have you truly tried to establish a special time and place to meet with the Lord? For me, that time and place is typically early in the morning down in the basement where my home office is located. The house is usually quiet in those pre-dawn hours, and I can focus on my relationship with the Lord before the hustle and bustle of the rest of my schedule completely overtakes me. But that's the best time and place for me. I'm a morning person. For you, however, it could be your lunch hour at work or later in the evening when the kids finally go to bed. These might be better times in your crazy schedule to quiet your mind for a few minutes in order to allow God through the Holy Spirit to speak to you. Experiment with your schedule. Try different times and places and see what works best for you. When you finally do discover that time and place when and where the Holy Spirit is speaking, though, push yourself to get back there each and every day. The Lord will begin doing incredible things in your life as you allow Him to speak to you through your own personal rocking chair.